The Super Bowl is a dream come true for many fans. For two fans from Seattle, that dream got derailed en route to New York for the game. Well, the NFL wasn’t going to let that happen. 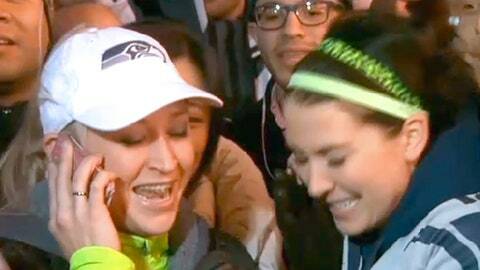 On Friday, two Seahawks fans – Nicole Hill and Sarah Agerup, from Seattle – appeared on a live shot on CBS New York. The duo explained that Hill’s wallet had been stolen at San Francisco International Airport. Their Super Bowl tickets were inside the wallet, Hill explained, according to CBS. Well, NFL commissioner Roger Goodell was watching the broadcast and intervened. Watch how it played out below. There’s more to the story, according to NFL.com. An NFL spokesman confirmed to Around The League that Goodell met the two women Saturday morning on Super Bowl Boulevard to give them tickets to Sunday’s game as well as the tailgate party. The women will also walk the red carpet and attend tonight’s NFL Honors show at Radio City Music Hall. For Agerup, the opportunity to watch her Seahawks in the Super Bowl is bittersweet. Her parents met on a blind date at a Seahawks game in 1991 — Agerup’s father, Brad, had been a trainer for the team in the late ’80s. Sadly, a drunk driver killed both her parents in 2009. It’s nice to see the two women got what was theirs back.